With the first and second round cleared, we felt relieved and the pressure on our shoulders were lighter. However, our nervousness increase as time passes by because results will be announced in a moment. 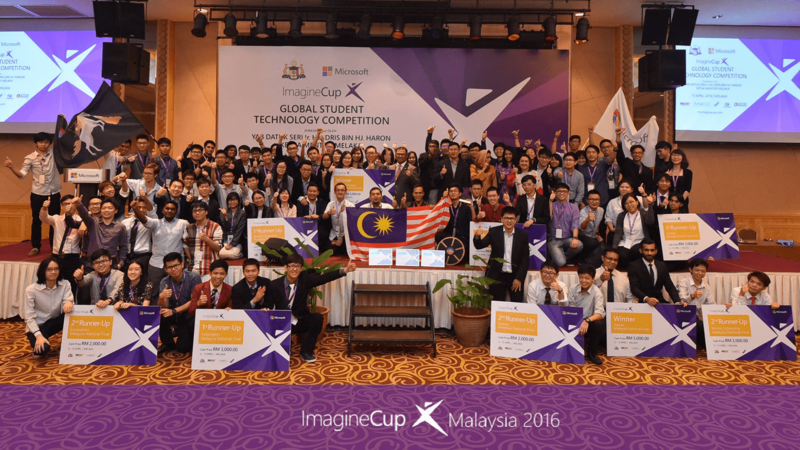 Who will be representing Malaysia in Microsoft Imagine Cup 2016? This is part 4 of a 4-part series sharing our experience through the preliminaries all the way to Microsoft Imagine Cup Malaysia 2016 grand finale. If you missed part 3 of our Journey through 2016 Microsoft Imagine Cup Malaysia, click here. Microsoft announced top 3 teams that were going to be in the running towards the Imagine Cup. It was indeed a nerve-racking moment as they revealed the top 3 slowly. Ultimately, top 3 of the World Citizenship were BAWA Cane, UNIMAS and Monash University. All top 3 teams from each category (Games, Innovation, and World Citizenship) were required to prepare for another presentation session on the grand stage. Moreover, organisers would only announce the winners of each category during dinner and only the winner from each category would be chosen to be on stage fighting to proclaim the grand winner title. With that, we could only guess and prepare for the next session. The trip from the Dewan Seri Negeri to the Philea Resort was quiet as top 3 teams were busy preparing their scripts. Henceforth, it may have seemed like we were in cold war as we were not talking to one another. Finally, we reached the resort and winners of each category were announced; BAWA (World Citizenship), Innovaboard (Innovation) and Burning Hair (Games). Our team, BAWA, was on an emotional rollercoaster when we were announced to be the winner of our category. We had conflicting feelings ranging from nervous to excited. It is because we would have to move onto the grand finale and present in front of hundreds, maybe thousands, of people including Chief Minister of Malacca; YAB Datuk Seri Ir. Hj. Idris Hj. Haron. To be honest, it was my first time being on such a big stage and presenting to a large crowd of people. Thus, compared to Daniel, I was more nervous and there were countless flashes of imaginary embarrassing moments that popped up in my mind; trip on stage, got my tongue twisted, and forgot my script. On top of that, I was born with stage fright so being on stage was clearly not my comfort zone. However, I could overcome my fears and quickly adapt on stage to present our project BAWA without any glitches. Our presentation was unfortunately not perfect. It was because our prototype was too nervous on stage that it could not work at all. With the nervousness of being on stage still intact, the overall winner was announced. Consequently, Innovaboard was announced as the winner of Imagine Cup Malaysia 2016. We do feel regrettable that we were not the overall winner but this failure is needed in the journey towards our success. Through this competition, BAWA Cane undergone a series of improvement into a better product. 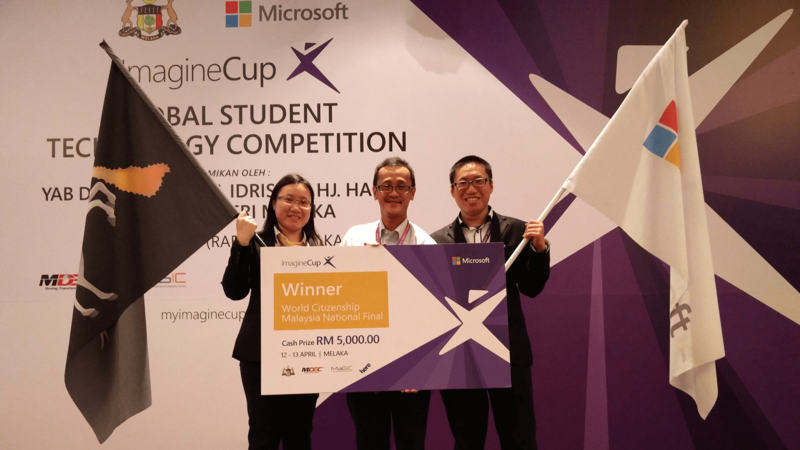 As the winner of the Microsoft Imagine Cup Malaysia National Final in the World Citizenship category, we were one step closer to represent Malaysia at the world finals. With this chapter of our journey comes to an end, we started gearing up represent Malaysia at the online Regional Finals in June. Stay tuned to know about our journey in Microsoft Imagine Cup!